I'll start with my favorite, Bel-Argus. You saw this one in my RABEANCO Violetta-inspired mani on Monday (don't forget to enter the giveaway!). Bel-Argus is a gorgeous, electric blue with a slight metallic finish. The formula has a translucent quality, yet it only took two coats for full opacity. It's like molten polish. Love this one! Chanel describes Azure as a metallic blue green. It's really so much more than that! Its multi-chrome finish shifts from pale-to-deep shades of teal, blue and green. My photo doesn't do a good job of showing the range of color...but it's there. In a strange way, it almost sparkles (the effect is more obvious in the full-sized pic). Azure is a perfect mix of trendy and refined. My swatch is two easy coats. And last but not least, we have Lilis, an intense coral creme. Few polishes come close to the remarkable formula and application of a Chanel creme. Lilis is no exception. I may have even "oooohed" out loud as I was polishing. (I know, that's totally ridiculous.) The color is bright and clean and perfect for summer. I used two coats. Chanel polish is pricey at $27 per 13ml bottle, but personally, I think it's totally worth it. 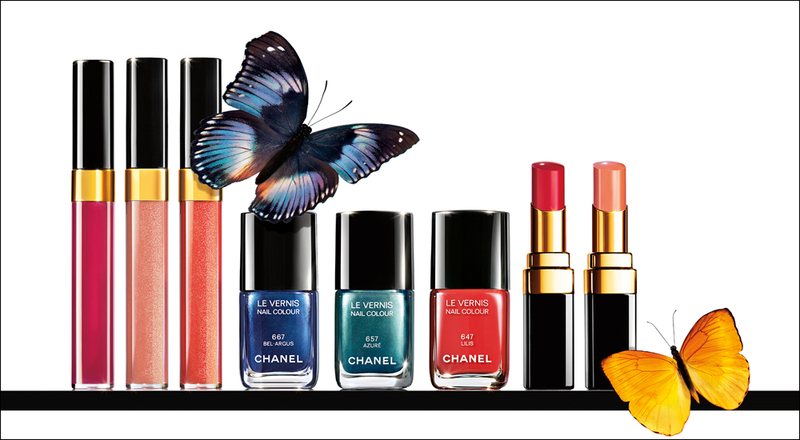 You can purchase Chanel Le Vernis at Bergdorf Goodman, Bloomingdales, Neiman Marcus, Nordstrom and Saks Fifth Avenue. You can also purchase direct from chanel.com. So I hate to do the math...but yes, I bought all three. How about you guys? Did anyone cave and buy these?